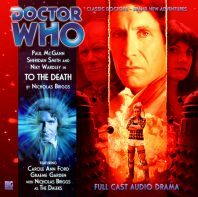 After four enjoyable series, The Eighth Doctor Adventures and the travels of the Doctor and Lucie Miller come to an end in ‘To the Death,’ a boldly bleak finale that never takes the easy way out. After another futile fight against the Daleks who control the Earth, Lucie, Susan, and Alex head back to England with only a small hope of saving the Doctor’s life as the true nature and extent of the Daleks’ scheme begin to emerge. While the modern television series has often been chastised for not being willing to follow through on promised deaths of characters, ‘To the Death’ aptly sums up the narrative for just about every character in some respect. The Daleks are at their most ruthless and merciless here, killing first and never bothering to ask questions or await further developments or orders. This approach is sure to appeal to those who feel that the Daleks have been used too frequently over the years and have lost some of their inherent menace, but it also takes away at least somewhat from the sense of undying hope that almost always pervades Doctor Who as a franchise. Yet while death is a permanent and impactful fixture that exemplifies just how serious and destitute the situation on Earth has become, not all deaths are allowed to reach their full potential in the grand picture. From his introduction in ‘An Earthly Child’ to his appearances from ‘Relative Dimensions’ up to here, Alex has quickly become one of the more fascinating secondary characters in Doctor Who audios, maturing from a naïve and misguided youngster to a responsible man willing and able to shoulder the many burdens placed upon him. His choosing to sacrifice his own life to allow the Daleks to be defeated fits in with the more heroic tendencies of his recent character development, but there was never any reason introduced dramatically or thematically whereby death could be seen as the filling of a progressive character arc. Instead, Alex’s death- while incredibly powerful- seems to occur solely to prove that nobody is safe, cutting short so much potential for a fascinating character with so many stories left to tell. That his death is not discussed by anyone after its occurrence, however, is a distinct misfire, and calls into question just how important the character really was. In a sense, this statement holds true for Tamsin as well, a character who was marvellously positioned to be an intriguing foil for the Doctor once the Monk managed to turn her against him. To be clear, it’s not surprising that she ultimately finds out the truth about the Monk and shifts her allegiance back to the Doctor, but the callous nature by which the Daleks exterminate her because she can no longer contribute anything is so sudden and superfluous that its intent is clearly for shock only. Her death does undoubtedly give the Monk reason to rethink his own pact with the Daleks when he is most needed at the end, but this story and its predecessor don’t quite manage to build up a great sense of affection and respect for Tamsin by the Monk to highlight how profoundly he takes her death. Still, it is nice to see Tamsin redeem herself before the end, and the fact that she truly believes she is saving human culture for the future and eventually sees the error of her ways is a brief but satisfying bit of closure for the character who also never quite got to reach her full potential. There is, of course, one final death to discuss, but it’s intriguing to note that ‘To the Death’ follows on from the Monthly Range’s ‘Patient Zero’ and requires some prior knowledge to fully understand the ramifications of what is occurring. It’s easy enough to understand the presence of the Dalek Time Controller and a cache of viruses from far in the future, both of which are now wreaking havoc on Earth in this period, but it’s an interesting choice that what has for the most part been a fairly self-contained series despite its frequent steps into continuity with returning foes relies so heavily on an audio adventure from the Eighth Doctor’s past to progress the second part of its series finale. Nonetheless, Nicholas Briggs give a masterful performance as the Time Controller, and it’s intriguing to note just how readily the Doctor admits that he is willing to cross his own timeline in order to set right what he now knows was a mistake in that earlier adventure to save Lucie and all of those dearest to him. Once more, though, it’s Sheridan Smith as Lucie Miller who really steps into the spotlight, proving once and for all that her strength of will and determination will never be hobbled despite her diminished physical abilities resulting from the plague. Having firmly forgiven the Doctor for past transgressions in the previous story, Lucie is free to act naturally here, and it surprises even the Doctor just how much her time during the war has changed her. She is insistent on preserving the web of time as the Doctor has always preached, knowing that she has found a way to destroy the Daleks in the present and unafraid of accepting the fact that her own past should not be changed even as she sacrifices aher own potential future. Even going so far as to pull a gun on the Monk, she basically pleads for the Doctor to give her permission to sacrifice herself, a plea he knows he must accept and which changes the character of the Doctor on the most fundamental level. This death hits all of the right notes, and Paul McGann’s sheer range of emotions as he believably experiences exasperation, rage, acceptance, guilt, and remorse is incredible. Not to be lost in the crowd, Graeme Garden and Carole Ann Ford give mesmerising performances as the Monk and Susan, respectively, and the fact that the Monk was the one who brought the plague to Earth initially and kept the Doctor from reaching them in a timely manner creates a nice arc that culminates in his later action of saving the Doctor and Susan from the time warp that destroys the Dalek fleet. Indeed, all of the performances, the direction, and the sound design are uniformly outstanding, and the bleak ‘To the Death’ creates a resounding finale to what has been a thrilling run of adventures despite Alex and Tamsin meeting their ends prematurely.